Lately, I’ve tried to take the advice of Lady Hirons and trim sweet things from my diet. Because I found myself reaching for sweet treats more often than not, I’ve decided that a three week fast from sweets was necessary to somewhat reset my cravings and remind me that I can, indeed, live without sugar. Sadly, this coincided with the beginning of a new rehearsal cycle with a director who likes to schedule Saturday morning rehearsals and loves to have breakfast treats to keep us motivated. I generally like to bake for my acting colleagues, so I was somewhat disappointed that I couldn’t bring a batch of soft, sweet cream scones with cream and jam. But then I thought, well treats don’t have to be sweet, and I could easily bake scones without sugar. But they might be rather bland. So I thought back to my old Nigella Lawson recipe for onion pie with cheese scone dough and decided to make a batch of cheese scones. 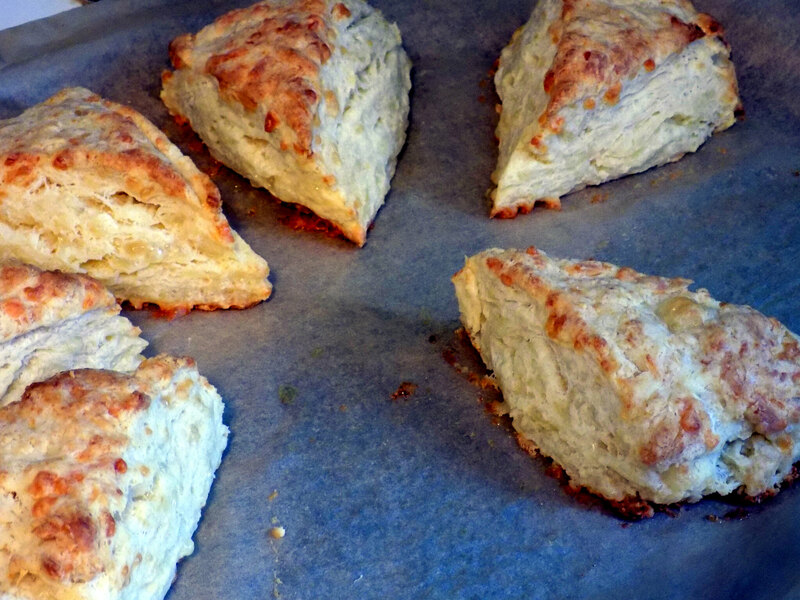 These are really a simple batch of scones, without even any egg to give them more structure. I recommend you use a nice, sharp cheese, as the sharper the cheese, the stronger the cheese flavor will be. I eat them without any accompaniment, though I imagine a tart jam might be nice. Preheat the oven to 425 F. Stir together the flour, salt, and baking powder, and then cut in the butter until it resembles coarse crumbs. Stir in the cheese. Add the milk, a little at a time, until a soft dough forms. Pat the dough out on a floured surface to about 1/2″ thick, and then fold three times, like a letter, and again in half. Pat this out again and cut out your scones. Bake for 15-20 minutes, until quite brown. Makes about 8 scones.